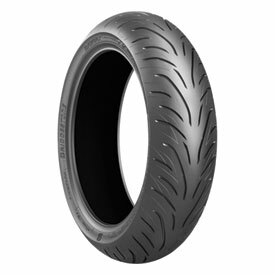 The T31 replaces the very successful T30 EVO as the next evolution in Bridgestone’s long line of sport-touring tires. You'll get the best wet weather performance without sacrificing handling in dry conditions or wear life. Newly developed tread pattern with deco groove is optimized to ensure confidence-inspiring wet weather performance with a bold look. Mono-Spiral Belt construction (MSB) provides dynamic handling response with a light, linear feel and superb line holding ability. 3LC (dual compound) rear construction enhance stability and all weather grip to shorten wet braking distance and improve traction. What a beautiful tire for a beautiful bike (Z900)! She handles beautifully at 100-110 mph cruising through the Ozarks. Felt like this tire was made for this bike! She really compliments all the qualities of the Z900! The Z900 wasn't meant to be ridden with your knees dragging around every corner, there's nothing to say that she couldn't, nor slamming on the brakes to set up for the next corner. She's meant to be ridden from the 5-7000 rpm range with the occasional 9000 rpm burst when needed, cruising from 80-110 mph, through one corner then accelerating to the next with the occasional downshifting and engine braking doing most of the slowing and then all over again. Which, when you think about it, is really how the T31 was made to be ridden. Fast speeds, fast speeds and fast speeds. Oh, did I mention fast speeds? The T31 shines when riding at the higher speeds these bikes were made for from a sport touring tire. However, all that shine is put into darkness when you try to attack corners with reckless abandonment like I was with the RA3. I actually felt a little nervous when trying to take some of the corners I had previously taken with no problem! Ah! So, what? I say! Just one trade off for another. Like I said, What a beautiful tire for a beautiful bike. Replacing the T30 EVO, this is a great tire for the ST1100. The stiff sidewalls make for a quicker turn-in that a soft sidewall. Dual compound gives me, an aggressive rider, right at 7K miles. I have been using the T30-T31 seriese of tires for over 5 years now. And will continue.